In selecting any technology it is important to understand first what you want to be able to do. I will admit there are some cool tools I run across and then wonder how I could implement them in a learning context. But I have found that having an objective in mind before hand allows me to sort and filter and evaluate the usefulness of the tool. In designing the summer section of HRD 4407 / 5507 – Technologies in Human Resource Develoment I needed to revise some of the assignments in the course due to the lack of availability of some of the technologies (See The Constant Change of Technology or The Death of SlideRocket). I’ve written about searching for tech tools for eLearning (see Finding the Best Tools for eLearning) and that is the process I followed as I selected the various tools for this course. The first information I sought was about the students who would be in this course. This would be a combined undergraduate / graduate course. Those enrolled as undergraduates would be at the end of their program while the graduates would just be at the beginning of their degree. While the name of the course is looking at human resource development, there would still be many students who would not be headed into a career in human resources. Understanding this variety in the students I took a step back and used a very broad definition of technology in HRD. One of the biggest limitations in this course was that it is a six week summer course. The timeline for this course would be quick. Knowing that I would have a variety of technical skills, we needed to jump into using the technology quickly. It would also be important to provide tutorials and keep things focused. I left this step out of the previous post, but this is what should always guide the selection of technologies in a learning environment. The course was redesign around the concept of a Professional Learning Network (PLN). This is a overarching concept that would apply to all the students and would get everyone in using technology tools, especially social media in a professional context. The previous course design incorporated all the student reviews of individual technologies into an ebook. The current course retains the objective that students will become an “expert” on a specific technology. However, in order to incorporate another social media tool, this one project was moved to a wiki format. The content would remain the same, it would be available publicly and would incorporate a useful technology tool that is used in many work environments. In consultation with the previous instructor of this course she recommended two wikis – PBWorks and Wikispaces. I created an account (free education account) on each system. This allowed me to see the interface and available tools. After a brief exploration I paused and created a list of what features I wanted in the wiki. Both options fit most of the items on the list. I could have also search for a comparison like this WikiMatrix or sought out a discussion like this Wikispaces vs. PBWorks, but I did not at that time. In the end, wikispaces had some impressive tools that supported the use of a wiki within the educational setting and the interface was intuitively easier to navigate. I am looking forward to watching our class wiki evolve. As with many eLearning projects there is a need for some project management. In order to meet the needs of a graduate program, moving this project to a wiki also provided the opportunity to guide the graduate students in project management. I have provided some vague guidelines, but the wiki page template recently posted in the course was co-created with the graduate students and the organizational structure of the wiki as a whole is in development – headed up by the graduate students. A wiki is a wonderful tool in a PLN. It enables professionals around the world to co-create a resource. One node in my PLN is http://ethosconsultancynz.ning.com/. Ning is a tool to create communities – it combines blogs, profiles, wikis and social media tools into a space all their own. And even though this community began in New Zealand, I have found it useful in my PLN. Building My PLN: Who to Follow? In considering what I want to learn and how I want to develop there are many ways I have used to find people to include in my professional learning network or PLN. In this post I will look at the process I used to find two individuals and some of the tools I have used to organize my PLN. Before looking for people, blogs or other resources, it is good to consider your areas of interest. So, now that I have some general areas, the question is how do I go about finding people, blogs and resources to add to my PLN. Here are two ways that I found key people in my PLN. One of the first places people use to find answers is “Google.” In the process of working on various projects, I will use this same process to find solutions to problems I encounter. In the searches, I will often discover a blog that consistently has great answers, suggestions and solutions. This is the type of resource you want to include in your PLN – one that consistently has answers to the questions you are asking. For me, this resource centered on designing learning experiences. The elearning Coach blog is written by Connie Malamed. Her background is in design and her blog post usually focus on the implementation of a strategy, tool or technique, making them perfect answers for questions. In addition to following her blog using Feedly, I followed her on twitter and connected with her via LinkedIn. After adding several people with practical answers like Connie Malamed. I started paying attention to who they were following on Twitter, whose posts they retweeted and who they referenced in their blog posts. Through this process I found someone who makes me think. I enjoy when I discover a new idea or a new perspective. It is important to include people that make you think and bring alternative perspectives. Howard Rheingold is one of those people that brings new ideas into my thinking. I do find that I agree with much of what he says and he does bring practical ideas to my attention. But he is also one of my resources that pointed out that you need to include multiple perspectives. You don’t want a PLN that constantly agrees with you – you don’t get new ideas that way. I find that his principles in NetSmart are good guidelines to follow. Feedly.com allows me to follow blogs, put them into categories and easily access new posts from one location. I use twitter to see what people are sharing and talking about. I have also looked up hashtags for conferences I cannot attend to follow the backchannel. WordPress also allows you to automatically send a tweet when a new blog post is published – allowing me to easily share what I am exploring. Along with individuals, LinkedIn also has groups. I have found some valuable people in the Instructional Design and Moodle groups who I have followed on Twitter and added to my Feedly account. So there you have some guidelines to help you in building your PLN. Who will you find? What tools are you using? Feel free to share in the comments so we can all build our PLN. Today begins a six week course that will focus on exploring technologies for a professional learning network (PLN). In this short time frame, together with my students we will blog about our learning and will create a wiki resource. (See https://tech4pln.wikispaces.com/) While there is not much to see at the moment, I hope we will have a wonderful resource in six weeks. I began my own journey in developing a PLN in 2010 when I started this blog. I participated in the MOOC Personal Learning Environments and Networks 2010. This was before “the year of the MOOCs“, so I feel it was quite different than the MOOCs of today. It was scary putting my thoughts and writing out for the world to see. I wondered if anyone would even want to read what I wrote. I connected with several people from around the world and enjoyed seeing how their experiences were similar and sometimes very different than my own. I have gone back and re-read some of my first posts and been reminded of some of the goals and inspiration I had. In preparing for this course there is one idea that continually comes to the forefront. The idea of documenting a learning path. There is an article from 1966 entitled The Case Against Teaching. (There is a similarly title article from 2001, but we are going to stick with the one from 1966). In this article, West is discussing the need for change in the education of physicians. This was a time when internships, practicums and working with patients as a student was rare. West argues that in order to become doctors, students should watch doctors doing doctor stuff – not listening to lectures (he says it much more eloquently). This got me thinking about teaching and learning. We have all experienced school in some form or another, and thus have seen “teaching.” However, since we all need to learn, have we seen “learning?” So much of learning happens inside, with pondering, reflection and connecting to previous information that we can’t really “watch someone learn.” But, but using something like a blog, we can document our learning – creating a learning path that perhaps someone else may follow and thus learn from our learning. So armed with blogs, twitter, LinkedIn, Diigo and Wikispaces, we begin this journey of learning. If you’d like to join us check out the link to the wikispaces and the Diigo group below, follow #tech4pln on Twitter and explore the list of student blogs. West, K. M. (1966). The case against teaching. Academic Medicine, 41(8), 766-71. 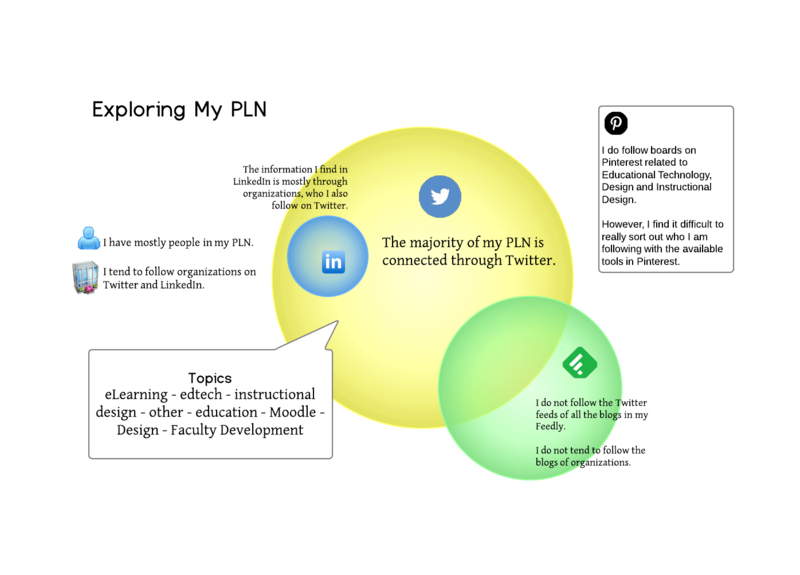 In reading articles, blog posts, discussion boards and perusing diagrams I find the fine points of defining the difference between PLE (Personal Learning Environment) and PLN (Personal Learning Network) a small portion of the dialogue. Especially when you add the information that one term evolved in America and the other evolving from Europe. In Emerging Technologies for Learning, Stephen Downes states that it is not in the technologies themselves, but in the thinking that underlies the concept. It is the idea of “rich tapestr(ies) of resources, dynamic and interconnected” (Downes, 2007) that draws me to the term suggested in Dave Cormier’s blog post 5 points about PLE’s PLN’s for PLENK10 and also introduced by Josh Underwood in the PLENK2010 forum of Personal Learning Ecologies. One of the amazing things of a community of learners is the capacity to increase knowledge. In reading through the articles this idea of PLE/PLN vs. the LMS – student centric vs. institution directed – freedom vs. controlled – dynamic vs. static. It would appear that if one’s PLE/PLN were maintained it could become a life-long portfolio of a learning journey. There is more to come on the Personal Learning Ecologies. The living, breathing, adapting, sustaining nature of a system, an ecology.